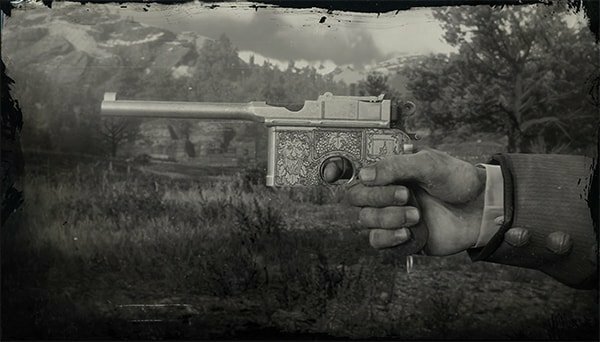 Midnight's Pistol is a Handgun in Red Dead Redemption 2. A rare Mauser Pistol, this weapon features gold-plated engravings and a black wooden grip. Previously owned by the late gunslinger Billy Midnight, defeated in a duel on a train departing Rhodes, this gun has an ammo capacity of ten roundsm and can use regular, high velocity, split point, express and explosive pistol ammo. Can be picked up after defeating the Legendary Gunslinger Billy Midnight, highly missable, during The Noblest of Man, and a Woman Stranger Mission.